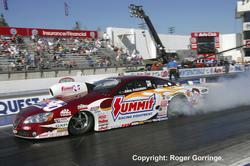 The season opener of the NHRA POWERade Drag Racing Series, the first event in the 2008 Countdown to the Championship, started in fine style with wall to wall sunshine and temperatures in the high seventies to low eighties Fahrenheit. Drivers and teams had to wrestle with a slightly different qualifying procedure, heavier race cars and more nitro in the fuel classes but each was ably met with just a few casualties ending up in the sand trap due to having to deal with the extra load in stopping. Who could have predicted the start of the season rush that Top Fuel Dragster rookie Antron Brown would have in the Matco Tools dragster as after the 4.513/331 on Thursday from Tony Schumacher, Brown showed the way on Friday with a 4.495/330 that was never overtaken. His excitement was apparent as he described his transfer from Pro Stock Motorcycle up to the Kings of the Sport: "Nothing can prepare you for this, I hit the throttle and my eyes got wider and wider, it was just like the warp drive they have on Star Trek with the stars going by". In the final standings Brown led with Larry Dixon number two with a 4.497/325, then Schumacher's 4.531 with Morgan Lucas in at four with a 4.514/333 and Hillary Will on five with a 4.521 at a whopping 334.65 mph. The 2007 FIA European Champion, Switzerland's Urs Erbacher made it in on the last try with a 4.859/296 and sat at number sixteen after a weekend of fiery tries. Round one of eliminations started with Brandon Bernstein running a 4.576/322 but losing to an on song Cory McClenathan who got the win light with a 4.518/329. 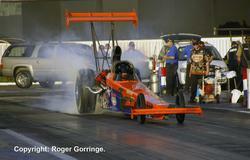 Dave Grubnic had to pedal hard but his 5.420/212 was left in the dust by Rod Fuller's 4.494/326. Alan Bradshaw hit instant tyre smoke in his match with Doug Herbert with the latter taking the light with a 4.644/325 to the slowed up 11.776/80. 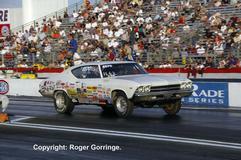 Bob Vandergriff Jr. struck the tyres at the two hundred foot mark and lost with the 8.210/96 as opponent Morgan Lucas zoomed to a 4.546/331 clocking. Urs Erbacher recorded his best numbers of the weekend, a 4.571/324 but to no avail as Antron Brown drove past the holeshot taking the win, 4.522/329. Larry Dixon held onto his startline leave and took the win with a 4.512/331 leaving Troy Buff to come second with a 4.686/286. 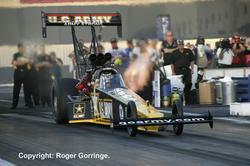 Doug Kalitta suffered almost instant tyre smoke the lost parts from a fuel line slowing him to a 30.838/52 as Tony Schumacher recorded the win with a 4.508/328. Another loser to the up in smoke gremlins was J.R. Todd as he spun the slicks off the line and tried to pedal the car only to record a 7.014/175 as Hillary Will pedalled her way out of her up in smoke pass to win with a 5.992/168. The second round was in the heat of the day and the first pairing saw Hillary Will doze on the line leaving Morgan Lucas to tie up the win with a 4.564/322 to the 4.594/325 that failed to catch up. Antron Brown's dream debut came to a smoky end when he blazed the slicks slowing to a 16.894/47 as Cory McClenathan ran a winning 4.530/329. Larry Dixon was first out of the hole against Rod Fuller but at the end of the race track it was Dixon getting the nod with a 4.551/310 to the 4.691/297 try. The last pairing of the round pitted Tony Schumacher against Doug Herbert and it was Schumacher who overcame the better leave by taking the win with a 4.511/331 to the 4.678/315 lose. The semi finals provided two great and close races with the first going to Cory McClenathan, a 4.555/329 had him just a car length over the line ahead of Morgan Lucas in the Lucas Oil machine who delivered a 4.612 and slowing 278 mph. Number two race was Tony Schumacher with a half car lead and win over Larry Dixon in the U.S. Smokeless Tobacco Company dragster, the 5.510/329 against the losing 4.573/317 that oiled the top end of the track. With the track almost all in the shadows as the sun went behind the grandstands Cory McClenathan in the FRAM backed car face Tony Schumacher in the U.S. ARMY dragster for the money run. Once again Alan Johnson had the tune up set correctly on the Army car as Schumacher launched first and never looked back recording the first Top Fuel win of the year with a fine 4.499/331 leaving McClenathan to follow through with the runner up place on a 4.536/329 clocking to end a fine weekend in a pretty well packed house. The massive crowds stood and cheered as John Force returned to the seat of his Mustang Funny Car after his huge accident last year, he still limps a lot but is training and exercising several times a day that has proven results by getting him into the fifth spot on his last qualifier with a 4.823/321 just behind Scott Kalitta who held onto top spot on the first two days, a 4.818/322. Melanie Troxel in her first year in the class took the Saturday top spot but ended up third with a 4.810/327 in the wake of Jerry Toliver who ran a 4.790/320 for number two spot. 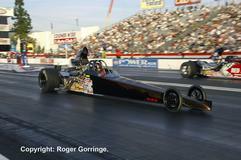 Leading the field was Tim Wilkerson with a surprise 4.790/325. 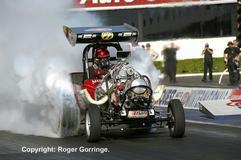 Gary Densham sat on the number sixteen bubble with a 4.866/315 to end the qualifying. The first round provided some surprises and some incredible action starting with the number one qualifier going out to the number sixteen, Gary Densham ran a 4.862/312 that beat Tim Wilkerson's slowing 5.099/270, then Jerry Toliver the number two qualifier went out against Jack Beckman as Toliver smoked the tyres and slowed to a 8.035/91 to the winning4.959/309. Scott Kalitta went up in smoke at the three hundred foot mark slowing to a 10.639/78 as Gary Scelzi clinched the win with a 4.911/317. New to the nitro class Bob Tasca lll took the win with a pedalling 5.235/225 as Melanie Troxel buried herself in tyre smoke at three hundred and fifty feet and her pedalled try of 6.968/130 was not enough. The following pair was John Force against his former driver and current Champion Tony Pedregon and what a spectacle it was as Pedregon firstly redlit then on reaching the thousand foot stage suffered one of the biggest catastrophic explosions ever recorded as the gear drive broke stopping the cam shaft turning resulting in a huge fireball and body shredder that put the car hard into the wall after a 4.983/267. Tony emerged by himself with some burns on his hands. Meanwhile, Force saw the debris and ended up in the sand after taking the win with a 4.805/327. After the clear up Ashley Force got many a cheer as she notched up a win with a 5.959/300 over the up in smoke 6.854/161 from Bob Bode. Mike Neff was on and off the throttle on his 5.374/205 attempt but failed to take the win as Cruz Pedregon passed his lead and took the 4.927/311 win. Ron Capps went up in smoke at half track then got crossed up and clipped the centreline cones that disqualified his run allowing Robert Hight to record the 5.521/280 with a tyre hazing win. In round two Robert Hight lost cylinders after pedalling the car at one hundred feet but still hung on to record the 5.291/295 as Gary Densham went into deep tyre smoke at three hundred and fifty feet slowing to a 9.088/97 lose. 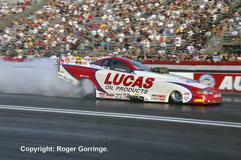 Ashley Force gained another rung on the ladder with a 4.873/318 holeshot win over Bob Tasca lll's 4.955/310. Gary Scelzi lost fire just off the line and did not complete the quarter leaving John Force through with a 4.871/312 win providing more cheers from the race fans. Both Jack Beckman and Cruz Pedregon suffered problems on their pairing but Pedregon managed to pass Beckman for the win, a 5.010/303 against the 5.122/295 lose. The semis saw Ashley Force lose after pitching the blower belt off at a thousand feet slowing her pass to a 4.996/246 as Cruz Pedregon ran on to get the light with a 4.850/325. 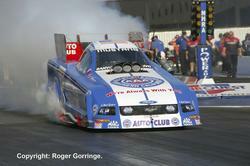 The other pair were John Force against team mate Robert Hight and Force had given instructions to just go for it but then went up in smoke at two hundred feet slowing to an 11.266/84 as Hight took full advantage with a 4.861/284 win to enter the final. 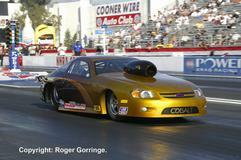 The final was Cruz Pedregon in the Advance Auto Parts Chevy Impala against Robert Hight in the Auto Club of Southern California Ford, Pedregon left first by a hair followed by Hight but Hight hauled him in and beat him by a half a car length in the lights, 4.861/284 to the 4.879/322 lose. It was Greg Anderson back in control in the factory hot rod Pro Stock division firstly with a 6.635/208 qualifier then a track record timing of 6.629/209 on the third qualifier. Under Anderson came 2007 Champion Jeg Coughlin with a 6.644/208 followed by Kurt Johnson on 6.644/208, Warren Johnson on 6.655/208 and in fifth spot Jason Line with a 6.656/208 and down on the sixteenth bump was Ben Watson with a 6.737/204. First round winners were Greg Stanfield over Max Naylor, Justin Humphreys over V Gaines, Jason Line over Bill Glidden, Allan Johnson over Matt Hartford, Warren Johnson beat Kenny Koretsky, Kurt Johnson ousted Mike Edwards, Greg Anderson beat Johnny Gray and finally Jeg Coughlin saw off Ron Krisher. Into the second round and the opening frame pitted Jeg Coughlin against Justin Humphreys, the better light and the win went to Coughlin with a 6.685/207 against the losing 6.724/207. Jason Line was left on the start by Kurt Johnson who wrapped up that win with a 6.675/207 to the better but losing 6.653/208. In a near identical leave Warren Johnson left a tad ahead of Allen Johnson but it was Johnson who clinched the win with a 6.702/205 to the 6.736/206 lose. The last pair in the round had Greg Anderson catch and pass the leave by Greg Stanfield recording the 6.637/208 against the 6.678/206. Jeg Coughlin managed a 6.666/207 that stayed ahead of Kurt Johnson's ACDelco Chevy Cobalt's 6.651/208 all won on a holeshot and Greg Anderson caught and passed the better leave by Allen Johnson's J&J Racing/Mopar, the 6.643/208 beating the 6.654/207. The final had the 2007 Champion Jeg Coughlin in the Jegs.com Chevy Cobalt take a slight leave but the 6.638/208 just failed to get the stripe first as Greg Anderson's Summit Racing Equipment '08 GXP clocked the win with a stunning 6.616/209 winner. The Top Alcohol Dragster win went to Duane Shields in the Shortline Express Markets nitro burner with a 5.377/270 win as opponent Joey Severance redlit away any chance of the win light with a -0.011 and a realised slowed up 16.041/52 from his blown alky machine. Top Alcohol Funny Car ended up with a battle between Brian Hough's Monte Carlo and Frank Manzo's Lucas Oil backed Monte Carlo and it was Manzo's better leave coupled with a 5.558/260 that took the trophy as Hough came in second with a 5.779/250 tryer. The huge Competition Eliminator class came down to a run off between Jim Cowan's '08 Cobalt and Dan Fletcher's '07 Cobalt. It was Cowan's 8.188/148 from the Cowan/Smith Racing car that took the win leaving Fletcher to runner up with a 9.196/109. Super Comp saw the run off between Kyle Seipel and Rick Beckstrom. It was decided when Beckstrom went under index giving the win to Seipel with a legal 8.924/166 against the breakout 8.886/182. Super Stock was wrapped up by Dan Fletcher with a 9.352/134 from his '69 Camaro as Brad Rounds ran the runner up time of 10.502/125 in his Chevy S-10. The Stock division win went to Toby Lang in his '69 Chevelle with an 11.630/108 as Jimmy DeFrank came in second with a 10.502/125 from his '69 Camaro.